Luigi Musetti founded “La Casa del Caffè”, a coffee shop in the centre of Piacenza, at Via Garibaldi No.14. With care and patience, Musetti prepared his first coffee blend in a small roasting machine and sold to the public. 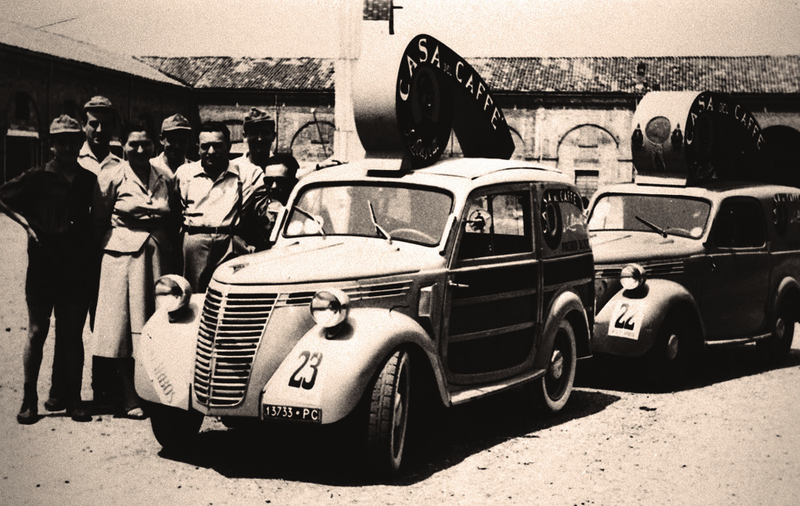 Caffè Musetti faced hard work and endured hard times when Italy was under aerial bombardment. After the war Luigi Musetti began to expand his business. The desire for progress was immense: cities were expanding and smiles were returning to people’s faces. And so the legendary Fiat “Giardinetta” estate cars were the first to set out from Via Garibaldi to reach remote Apennine villages and bars in the province. Luigi Musetti, his wife Dina and their sons Achille and Lucia are working tirelessly to achieve their dream. 1960 a new era: the first major seat. The Minister Umberto Tupini and the Senator Alfredo Conti participate to the opening of the the new Musetti headquarters in Viale Sant’Ambrogio, next to one of the first typography in Piacenza. With them the Musetti family takes a new way of working and their objectives become closer and concrete. Luigi Musetti was a far-seeing man and aware that his passion for coffee would lead him to great success. The 70s saw the participation to the first important fair and unfortunately the serious illness and subsequent death of the founder. Achille Musetti will take even more care about the fortunes of the company starting to travel and to create a network of contacts which will lead him slowly over time to export his product abroad. France, United States, Japan, Great Britain ……. Musetti is becoming a brand of quality to be exported in far-away places. The Consortium “Piacenza Alimentare” was created in 1980 by the local Chamber of Commerce and since then it has been playing a fundamental role in the local economy starting a process of internationalisation for those Piacenza small and medium-sized food companies willing to export their products. At present the Consortium gathers seventy five companies, which are renowned for their reliability and tradition, but most of all for the quality of their products, including those which are guaranteed by the relevant Safeguard Consortiums. Achille Musetti, always cast in the future, becomes member of the Consortium increasing its brand visibility and getting ahead with his father’s job on international markets. In 2003 Musetti moved to Pontenure, a town in the Piacenza district. Here they build a modern plant where technological innovations allow to offer a higher and higher coffee quality and to keep raw materials under stricter controls. They define a vacuum packaging process under protective atmosphere to preserve the real Italian espresso aroma and flavor. They open also the Italian school for coffee professionals whose responsible is the well-known barman Luigi Lupi. Bartenders from all over the world learn the secrets of Italian espresso, from coffee latteart to cocktails. 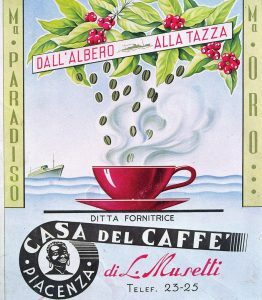 Nowadays Lucia Musetti and his son Guido lead the company keeping unchanged their love to coffee which has always characterized the Musettti family choices. They preserve their origins, respect their tradition and exploit all that is useful from innovation and future. A unique and precious new Blend “Gold Cuvé” dedicated to Musetti’s 80th anniversary. after more than eighty years in the business Lucia Musetti together with her son Guido are in charge of the company. They have kept alive that passion for coffee which has always characterised Musetti family decisions; they retain their roots and respect their traditions while taking on board all useful elements offered by innovation and the future.